I have a teacher friend who once downloaded a sound clip of crickets chirping to play when he threw out a question and was waiting for a response from his students. We’ve all been there. Sometimes class discussion flows and sometimes it doesn’t. But there are things we can do to help it along. Let’s start with types of discussions. Sometimes, if a group isn’t responding to one discussion format, they may get more out of another. There are so many! It’s nice to work with a variety to keep things interesting for students, but it’s also good when they can get used to a routine. See what works best in your classroom. My personal favorite is called the Harkness discussion. This format originated at Phillips Exeter Academy as a new strategy to promote student-centered discussion. Students sit in a circle and the teacher acts as a discussion guide but rarely participates. I learned about Harkness my first year as a teacher, cobbling together information about it from articles, and launched an experiment in each of my classes to use it for one month and see what happened. I would help students to be well prepared for discussion, arrange the desks in a circle, invite someone to sit on the side as a discussion observer and take notes on our discussion dynamics, and then invite anyone who wanted to to start the discussion. Then I would industriously take notes on what my students said and try to stay out of the conversation unless it veered dangerously off topic. When there was a long silence and every eye in the room fell on me, I would just continue writing in my notebook, avoiding their eyes and NOT rescuing them. Eventually someone would jump back in and the conversation would continue. At the end of the class our observer would report back to us on our dynamics, and I would ask for one recommendation for improvement. At first it usually had to do with awkward pauses or the fact that not everyone had participated. But as time went on, the recommendations became more complex, relating to text references, gender dynamics, interdisciplinary connections, interruptions, and more. At the end of the month, I felt all my classes – honors and regular – had made significant progress in their ability to take ownership of their dynamics and conversations. But I wanted to learn more about Harkness. That summer I attended the Humanities Institute at Phillips Exeter, spending a week learning about how best to teach using Harkness and participating in Harkness discussions so I would understand the dynamics from the inside. Not only did I come out of the workshop a better teacher, but I met my future husband at the Harkness table. No wonder I like this discussion method so much! If you’re interested in Harkness, check out this post giving a few more details about how to get started. Another great discussion option is Literature Circles. The first time I did literature circles I had two books I just couldn’t choose between in my curriculum. I wanted to read The Sun Also Rises and The Great Gatsby with my juniors, and there wasn’t time! So I came in one morning and pitched them both. “Read Gatsby!” I said, “You’ll be taken on a romantic adventure through the roaring 20s.” “Read The Sun Also Rises,” I said. “You’ll wander through the streets and parties of Pamplona with travelers and bullfighters, guided by Hemingway’s gorgeous words.” I made recruitment posters for each book. In each of my classes, about half the students chose each text. If one group was a bit too large, I would try to persuade one or two students of the benefits of the other book. I created groups and handed out the books. I told the students they’d have opportunities each day to meet in their groups and discuss the reading, and that they’d be doing a multigenre presentation at the end of the unit to share their novel with the other half of the class. Then I gave them time to create a reading schedule and choose roles. Many teachers who use literature circles use discussion roles as a way to help formalize the discussion structure. Each day every student (or most, if the group is large) in the circle is assigned a different role. So on one day a student might be leader, on another day the person in charge of bringing in several questions to start the discussion, etc. There are a range of roles, and you can add any that you think would be helpful for your own students. If you are doing literature circles this way, you will want to print descriptions of the roles to share with your classes. Once my students all had reading schedules and roles to prepare for, the month pretty much took care of itself. Sometimes we would meet as a whole class to work on writing activities or other pursuits, but a large chunk of every day was spent in literature circle groups. I would rotate from group to group to listen in and be sure things were on track. I’d also collect the notes students had taken to prepare for their roles and give them credit for completing this important prep. At the end of the month students began to prepare for their presentations, getting creative with ideas to share the themes and feel of their novels with their classmates. Not only did the presentations include great information, but we also ate Spanish food and watched a Great Gatsby fashion show. If you’re interested in doing literature circles, simply make sure you have group sets of whatever novels you’d like to share with your students, a rundown on the roles you’d like them to use and the days you’ll be meeting in groups, and a handout describing the type of presentations you’d like to see at the end. Then enjoy the change in the style, flow and creativity of your classroom! Harkness and Literature Circles are, clearly, pretty major commitments. This next form of discussion can easily be introduced and tried for one day. It’s called a Fishbowl Discussion. For a fishbowl discussion, you arrange the classroom so that a group of students can sit in an inner circle and a group of students can sit around them in a wider circle. Students in the outer circle are not allowed to participate in the discussion, but are invited to take notes and write down questions and ideas. Then, after five or ten minutes, you ask the circles to switch. What I like about this strategy is that every student will have a chance to be part of a smaller, more intimate discussion and hopefully express her opinion. At the same time, every student will have an opportunity to listen carefully to his peers, taking notes and learning from others. Students who have been stuck outside the discussion are often eager to express their opinions by the time they finally get to participate. So there you have it, three forms of discussion worth attempting. Harkness, Literature Circles, and Fishbowl discussions are all completely different ways of approaching the text aloud, and chances are, at least one of them will work well in your classroom. This next section is about discussion prep. I never like to jump into a discussion without a bit of warm-up. Students’ minds are everywhere but on the text when they first enter the classroom. In the passing period they may have been cramming for a science test, fighting with a significant other, texting friends, checking facebook, worrying about college applications… you get the idea. Expecting them to immediately make thoughtful contributions to discussion is unrealistic. That’s why I like to start discussions with a five or ten minute warm-up. #1 The Question Pass: To do a question pass, ask every student in the room to write down a question about the reading at the top of a page in their notebook. Ask them to avoid yes or no questions. Then ask everyone to pass their notebook to the person next to them. Give the class one minute to respond to the question. Then do another pass. After four or five passes, let students return the notebooks and then read their answers. Begin the discussion by asking for a volunteer to read their question. At this point at least four people have thought through everyone’s question, so no one should be caught by surprise. I find the discussion usually flows pretty well after this warm-up. If the discussion is being led by the students, they have plenty of questions to ask. If you are leading, you can always call on someone to read their question when a subject has run dry. #2 Journal Entry: Come up with a question that connects your students’ lives to the material you are discussing. For example, if you’re reading The Scarlet Letter, you might ask: What do you think would be harder, taking the blame for something you and someone else did together, or watching someone you care about take the blame for you? Let students write for a while. Then begin the discussion with the question students have already considered. #3 Partner Activity: Asking students to review the reading by completing a short and fun partner activity gets the ball rolling quickly. I have a lot of handouts I use for this purpose – you can make ones that are not particularly specific to the reading so you can use them again. For example, ask the partners to create a soundtrack of three songs perfect for a movie version of the reading. Or to pretend they are covering the action for the New York Times and need to write ten tweets that describe the events in the reading. Or to imagine they are writing a blog post form the perspective of one of the characters about the reading. It’s pretty easy to brainstorm these quick activities, and they help students review the reading in a fast fun way. To further reinforce the warm-up you can have the partnerships share with each other for a few minutes before heading into the full group discussion. #4 Acting: Have students get together with three or four other students. Ask them to create a 60 second version of the reading from the night before. They should write a (very short) script and decide who will be which character. Then they can practice it a couple of times. Randomly choose a few groups to perform for the class before you start your discussion. #5 Question Contest: Ask students, alone or in pairs to take five minutes and write as many discussion questions down as they can. Offer a prize for the student (or students) who comes up with the most. I did this once with a homemade brownie as the prize and boy did the questions flow! From there it’s easy to start the discussion with someone’s favorite question. So there you have it, five quick ways to help students warm up for discussion. No doubt you’ll think of many more! Our final section is about grading discussion, no one’s favorite task. Discussion participation is a relatively intangible thing, though we know when a student is doing a good job with it. Still, it’s hard to create a paper trail to show a student when they are NOT doing a good job with it. To quote Yenta in A Fiddler on the Roof, "am I right or am I right???!" So here are a few ways I’ve used or heard of over the years to streamline the process. Maybe one of them will be just what you’re looking for! One of my favorite creative ways to grade a discussion is to do a class challenge. The purpose of the challenge is to encourage all students to participate. In every class I’ve ever taught, there are discussion dominators and students who rarely if every participate. It’s one of the reasons I like to use the Harkness method, so students become more aware of their own discussion dynamics and begin to improve them. I usually do the challenge when we’ve been doing Harkness for a while, and the students have had a chance to adjust to the system. Then I let them know that I will be giving everyone in the class a bonus grade of 100% for the day (I use points – so they get a free 10/10 in my gradebook) if everyone speaks at least one time during the discussion. Sounds easy, right? This provides quite an incentive for dominating students to quiet down and quiet students to try to find the courage to speak up. I try hard to make sure everyone has a chance to warm up by writing down questions or ideas for the discussion, so students who struggle with language or get really nervous in front of their peers can just read something from their notebooks. I also reinforce to students that they will not get a bad grade if they do not meet the challenge, and I will offer it again soon. It’s not easy! But it can be very eye opening for everyone when they realize quiet students have good contributions to make and that the dominating group doesn’t actually have to dominate. 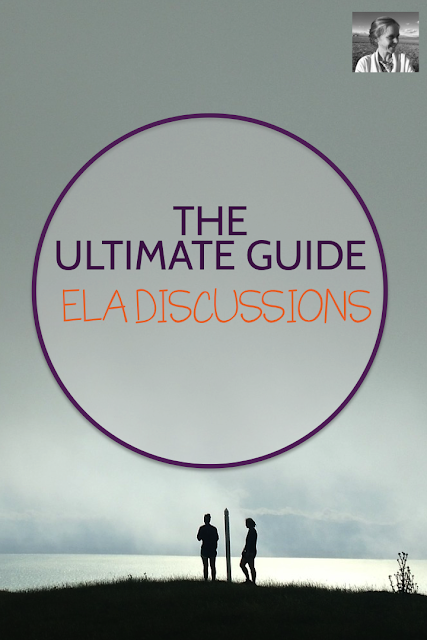 Another easy way to grade discussion is to make it your “round up or down” factor. Let students know that if they are right on the edge between B+ and A-, C and C+, etc. you will be thinking back to their classroom contributions to help you make the decision which way their grade will round. This will matter a lot to some students, and it doesn’t require you to create a participation grading scheme to use every single day. If you really want students to care about their discussion grade, you can always use a chart system. Create a chart with everyone’s name and a series of columns where you can write in the date of the discussion. Use symbols like check, check minus, or check plus to jot down the level of their participation on any given day. Put a zero for students who clearly did not prepare or participate. You can either be jotting these down during a discussion if it is student-driven, like Harkness, or while students are doing a closing activity. You can even quickly do it as they walk out the door, though that is always more complicated if you are getting ready to welcome another class. At the end of the quarter you can look back on your chart and give As to majority check plusses, Bs to majority checks, and Cs to majority check minuses. Combos of zeros and check minuses will probably funnel to the D or F range. The exact system will just depend on what works for you. I hope this post gave you some ideas for improving your class discussions. Since you made it all the way through this long post, I bet you are the kind of teacher who is always looking for ways to make a difference in your students lives by teaching creatively. You should join my new Facebook group, Creative High School English. I can't wait to see you there!